What is Sore Throat? Sore throat is inflammation (infection) of the throat. 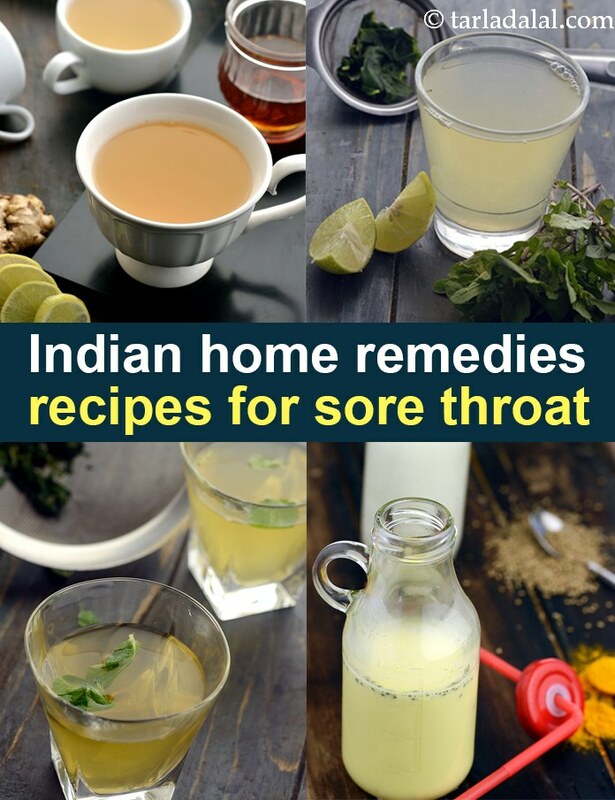 Though there is not much one can do to make it disappear at will, these remedies are sure to make your throat feel a lot better. 1. Salt water gargle: Gargling with warm water made by dissolving ½ tsp of salt in a cup of warm water, is a tried and tested remedy. Repeat this as often as possible for a speedy recovery. 2. Clove (laung / lavang): Two to three lightly roasted cloves should be kept in the mouth. The oils released from the cloves help to soothe the throat and also keeps your breath fresh. 3. Cinnamon (dalchini): Add a tsp of cinnamon powder and a tsp of honey to a cup of warm water and sip on it. 4. Lemon: Combine the juice of ½ lemon with 1 tsp of honey in a cup of hot water and sip it while it is still warm. Repeat this at least two or three times a day. 6. Tulsi (Indian basil): A concoction made by boiling tulsi leaves in water is a very well known remedy for sore throat. See the recipe of Tulsi Tea. Easy Tips for Soothing a Sore Throat 1. Try to serve foods at room temperature or lukewarm as hot food may cause throat irritation. 2. Have semi-liquid and soft foods which do not require much chewing. However eat enough to meet up your daily nutrient requirement. For example, a bland khichdi, a milk shake, roti dipped in dal are all good choices to ease a sore throat. 3. Do not eat meals in a hurry as this may be irritating for the throat. Sit down in one place and eat in a calm and relaxed atmosphere. 4. Avoid smoking as it aggravates the throat and interferes with the infection-fighting activity of the cells. 5. REST a lot as it gives your body a better chance to fight off the virus.